In this month’s team post, we’d like to introduce you to Andrew Juarez. Andrew is the newest member of the Onehub Design team and recently completed is first half marathon. Q – How did you get into long distance running? A – About 9 years ago, a year after graduating high school, I started to develop a (somewhat) regular fitness routine. Lifting weights and strength training were my focus, but I would add in about 20 to 30 minutes of pavement or treadmill running a few times a week. For several years, I would run the same distance of about 3 to 4 miles each time. It wasn’t until about the end of 2011 that I began to push my distance further. I started tracking my runs with a smart phone app that stores various bits of data such as distance, duration, mile times, altitude, calories, etc. I would use the data as motivation to push myself on subsequent runs. In the fall of 2012 when I moved to Seattle, I discovered some great areas for running. I spent a lot of time improving my distance by running around Green Lake as well as areas of the Burke Gilman Trail. I also did some research on midsole running techniques, proper footwear, and nutrition. By 2013, I was comfortable running 8 to 10 miles with an average mile time of about 8 minutes. Q – What is it that keeps you going during a long run (motivationally, for example, do you listen to music while you run or daydream to relieve stress)? A – Definitely music! Some of my favorite tracks to listen to while running are Motley Crue’s Kickstart My Heart, O Fortuna, the Mortal Kombat theme song, and I Ran (So Far Away) by A Flock of Seagulls. A healthy dose of caffeine before I go for a run is also helpful! Q – What is the most rewarding thing about long distance running to you? A – Finishing! But also just being outdoors and relaxing my brain for a bit is nice as well. Q – What is the longest distance you have ever run, and how do you train for something like that? 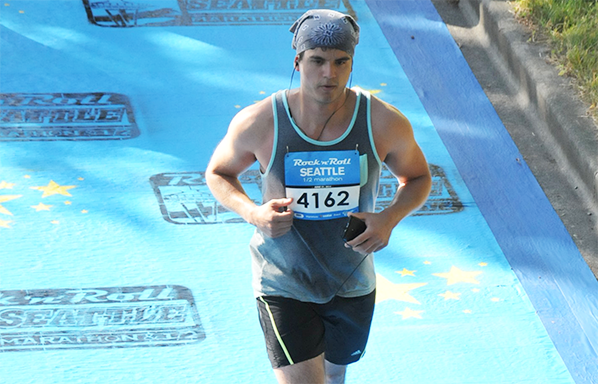 A – I recently ran my first half marathon (13.1 miles) at the Seattle Rock ‘n Roll Marathon and Half Marathon Series this year. That’s the longest distance I’ve run so far. As far as training for the half, I didn’t have a strict running regimen. On a really good week, I would get in about 4 total runs. Three of those runs would be around 4 to 5 miles, and one of the runs would be a longer distance – about 8 to 10 miles. I’d try and change up my route often as well, and make sure I was hitting some good hills and inclines and not just running on flat pavement. I also began wearing lightweight “minimalist” running shoes. But in doing so, I had to change my running technique in order to reap the benefits of “minimalist” or natural running – which essentially consists of running with a forefoot strike rather than a heal-strike to the ground. But if I was to give some basic advice to someone wanting to run a half marathon I would say first, do your research on form and technique, proper footwear, and good nutrition habits. Then just get out there and start running. Try to gradually increase your distances each week or two – even if it’s only a quarter or half mile at a time. And last but not least, avoid wearing cotton, and buy some Lanacane! Q – How does being a long distance runner help you in other areas of life (doing design at Onehub, for instance)? A – It definitely helps me keep a healthy balance in regard to my activity level as a web designer. But it’s also a great way for me to think of new design ideas or concepts. Long distance running is as much of a mental activity as it is physical. So when I’m out running a relatively long distance, I’m usually not focusing at all on the running part of it. I usually have some idea or thought circling my head that becomes my focus. You eventually get into this Zen-like meditative state of mind when you’ve been out running for a while. When you get there it’s much easier to focus on one single thought rather than being bombarded with lots of thoughts and distractions. It’s quite relaxing really. Q – How can we keep up with your running accomplishments (ie. the upcoming half marathon)? A – I’m currently not training for any upcoming races at the moment. But if I do, maybe I’ll tweet about it or post a photo. You can find me on twitter @drurez. We hope you have enjoyed getting to know our design team member, Andrew! Stay tuned for the next Onehub staff spotlight interview. You never know who you’ll meet!